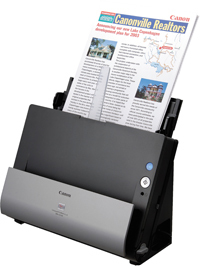 I was really impressed with the scanner, the speed is impressive and the ability to handle various size documents. I was worried about how the scanner would deal with tatty paper, but the scanner has no problems with it. When it does encounter a paper jam, the software allows you to reset the paper and then carry on. I would have no hesitation in recommending this scanner. Trade scanners have been a pleasure to deal with, answering all my question before purchasing the printer. Many thanks for your help. My 1 x Canon DR-C125 scanner is great and does excatly want I need, without the hassle of a combined printer / scanned which was slow and always got stuck. th my scanners are doing fine , They were a really good choice as per your advise. The Scanner is Quick & easy to use. Your service was excellent as well when I wanted the Scanner checked. Yes Wei am happy with my scanner and it is working well, thank you. Very good...thinking about buying another scanner! You wre very helpful Thanks. CaptureOnTouch has been redesigned with a streamlined user interface for a more intuitive scanning experience. Users can quickly convert their paper documents to multiple file formats (PDF, TIFF, JPEG, BMP and PowerPoint) and can also scan documents directly into SharePoint or Evernote. For a simple document filing solution, use CaptureOnTouch – and create searchable PDF documents that enable easy text-based search and retrieval. Documents can also be scanned to PDF/A files – the standard format for long-term archiving. The DR-C125 comes with a powerful range of 'out of the box' software that will enable users to work more efficiently. Along with CaptureOnTouch; Bizcard, OmniPage, Paperport, eCopy PDF Pro Office and PageManager (Mac) are all included to help increase productivity. Scan direct to the cloud-based data management service, Evernote. The CaptureOnTouch software includes a job button that scans and sends data directly to Evernote servers. Information can then be retrieved using your mobile smart phone or PC from anywhere around the world.